Our hens live a happy healthy life, roaming the open pastures on our farm. We use the chicken caravan, a fantastic addition to our Free Range Farm thanks to our savvy friends at Chicken Caravan. The caravan provides shelter, water, roosting & nesting space and is moved each week ensuring the flock always has access to fresh pasture. Alpacas protect the flock from the threat of predators. Our eggs are natural. As a small scale family farm, we are part of the growing movement of producers who realise the importance of natural, chemical free food production and its health benefits. Our hens are fed a vegetarian grain diet with NO artificial yolk colouring, antibiotics or hormones. We do not use chemical pesticides or fertilisers on our farm and use a permaculture system to nourish the soil. 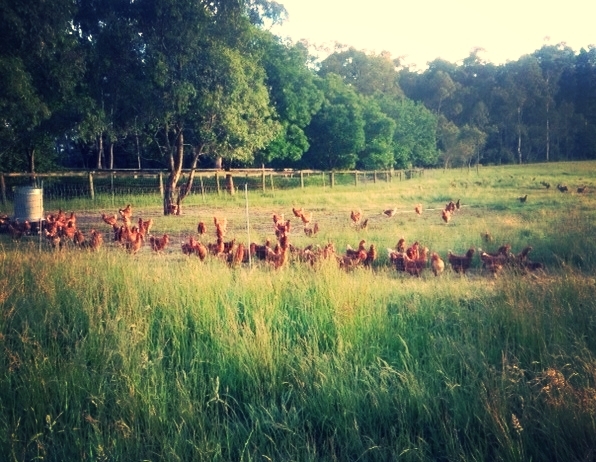 Our farm is certified by the Free Range Farmers Association of Victoria.